The Anthropocene is the term now being widely used to describe the geological epoch of our current times that highlights the impact of human habitation on the planet. This term focuses on the extreme and profound effects on land, seas, environment and species that occur as a result of human impact on all aspects of the creation. The Anthropocene challenges our understanding of God and our relationship to the earth as co-creators. This is a new horizon and it is marked by a sense of urgent crisis. This includes the current environmental crisis, but also a reconsideration of our future as human creatures and our place in God’s intentions for the earth. Is this planet our play thing so that we can use all its resources without reference to other species or is it a garden that sustains all of life? 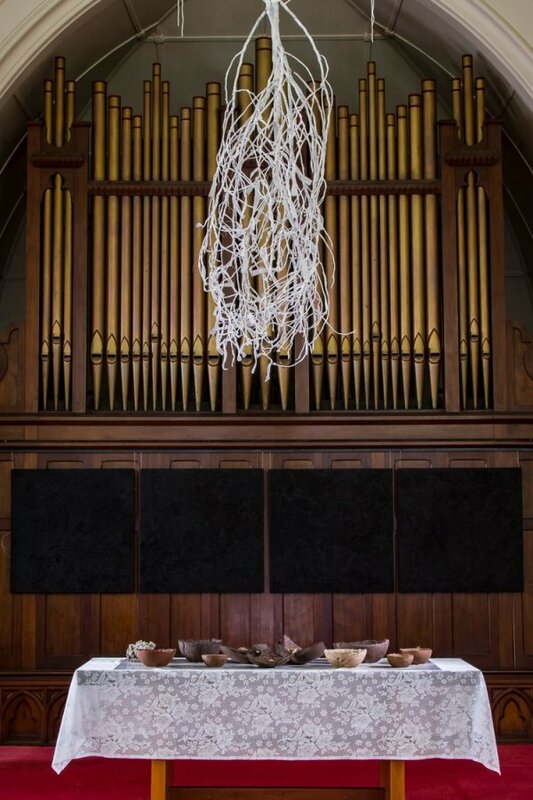 During May 2018 the Adamstown Uniting Church was the venue for the first in a series of six art installations, entitled Altar/d, that was held over six months by a range of diverse Australian artists. The installation by Dr Penny Dunstan entitled ‘Dirt, Soil, Earth’ brought connections to the wider landscape of the Newcastle region that is pockmarked by large open cut mining and the resultant major shifts to the natural landscape. On the communion table the artist placed a number of bowls made of various soils from the region, that offered a range of contrasts from healthy life bearing soils to those found around mine sites where little nourishment is found. In the course of the month-long exhibition these bowls began to crack and fall apart, turning towards their original condition of soil. Given their symbolic reference these containers made material links to the nourishment that is expressed at the eucharistic table. Above the table a small tree was suspended upside down, its bare branches reaching down towards the soil bowls. The artist explained that this tree had been burnt from the roots up by the excessive amount of coal dust found in the areas where the land had been supposedly rehabilitated. A meter or so beneath the soil surface the ground combusts at 500 degrees. This then has become a burning bush. It has been delicately bandaged. It hung like a pointer above the table with its white bandages flickering in the warm moving air of the sanctuary. 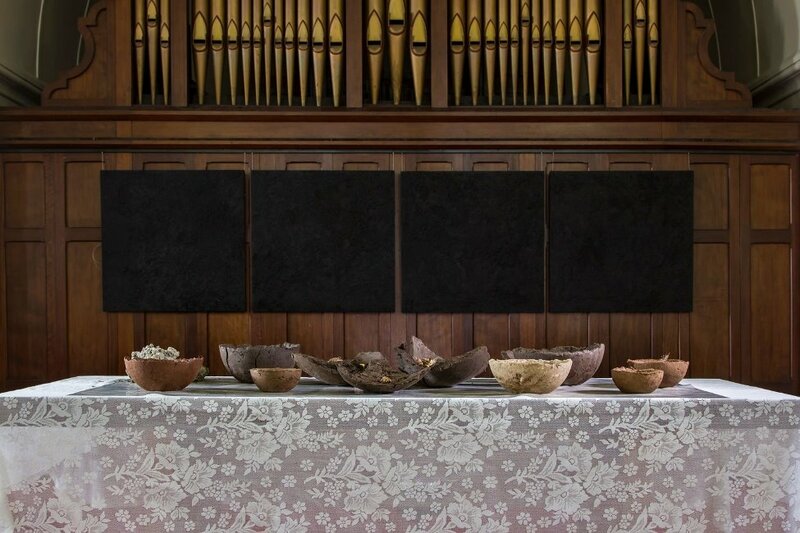 Behind this ensemble were four black panels painted with coal dust. Their material physicality brought into the space the otherwise unseen presence of coal mining in the region. Newcastle remains one of the largest exporters of coal through its port to the world. These difficult connections are ones that are usually left outside the doors of the church and their very presence in the sanctuary asked questions about the nature of our worship and its connection with the land we inhabit and seek to care for. Penny Dunstan has a unique background in exploring these sorts of connections having worked as an agronomist, a soil scientist, and then more recently doing postgraduate studies in contemporary art. Her specific project was to respond to the reinstated landscapes around open cut mines that are formed through the movement of millions of tons of soil and debris into a picturesque view of ideal rolling hills and woodlands. Walking through these newly formed lands, she created art works that responded to these new places of the Anthropocene. Her work invites a clear awareness of the ethical relations about the way we use the land and the environmental impact of mining and the burning of fossil fuels. 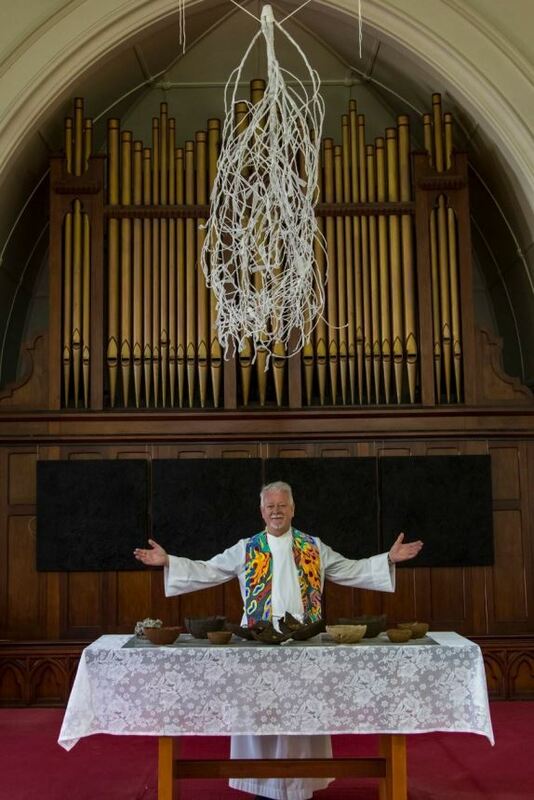 The introduction of this art installation into the church broadened the horizon of our worship to include the rivers, hills and valleys that supply our food and assure our wellbeing. Each Sunday elements of the works were included in worship, thereby deepening their capacity to work as containers for memory. They in turn called up deep memories of the land and increasingly challenged our assumptions about our place in this particular landscape. This artistic intervention disrupted our liturgical prayers, which then required an adjustment that allowed for innovation and new insights to develop. These works invited us to see the land that we inhabit with new eyes and then to pray and act towards a possible just future. Penny Dunstan: Dirt, Soil, Earth, 2018, handmade soil bowls, burnt tree, bandages, coal on canvas, dimensions variable. Adamstown Uniting Church, Newcastle, Australia, 4 – 28 May 2018. Photographs by John Cliff.